Increase Your Workforce without Hiring! Maintenance planning and scheduling should dramatically improve the productivity of maintenance. For example, a group of 30 maintenance technicians should be performing the work of 47 persons when aided by a single planner. Yet most maintenance organizations do not have a planning function and most that do are frustrated. 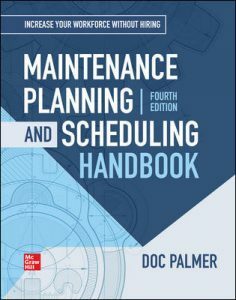 Created and led by the author of McGraw-Hill's Maintenance Planning and Scheduling Handbook, Doc Palmer, the workshop reviews the fundamentals and then provides class exercises to illustrate the principles and techniques to achieve success. This 2-day workshop not only covers the theory and vision, but the nuts and bolts of how planning and scheduling work. Throughout the event, the course encourages the thoughtful development of planning and scheduling activities within your own facility by your team. This course allows class participants to take specific practices home to their own organizations to implement a new planning organization or dramatically improve an existing one. A water and wastewater utility increased its completion rate from 35,000 to 59,000 work orders per year with a 10% smaller workforce. Another wastewater utility completed more CM and PM work while saving $300,000 in overtime, in the first year. An energy plant increased its completion rate from 135 to 203 work orders per week. A pulp mill increased its completion rate from 170 to 225 work orders per week. Recognizing that most plants already cover their reactive maintenance, almost all of any extra work order completion is purely proactive work. So planning and scheduling answers the question: “How can I do extra proactive work when I have my hands full with reactive work?” Discover and take home these practices to your own company! This workshop prepares maintenance personnel to become successful. Maintenance Planners and Schedulers who support the Planning and Scheduling function should attend this workshop. The class gives company Change Agents a firm grip on how to implement a successful program. Maintenance Managers and Supervisors, Operations Managers and Supervisors, Purchasing, Materials Management, and Maintenance Engineers, IT Support, and other Reliability personnel including shop floor Craftspersons and Maintenance Clerks should also attend to understand their involvement necessary to support the improvements. Richard Palmer and Associates All rights reserved.